One of the most comfortable, classic ways to take in Florida's natural beauty is by pontoon boat. For decades, Floridians and Florida tourists alike have enjoyed leisurely days out on roomy, peaceful pontoons. Compared to high-powered fishing boats and airboats, pontoon boats are a quieter, less environmentally invasive way to explore Florida's waterways. Perhaps the best thing about a Florida day spent out on a pontoon boat is the fact that it won't cost you an arm and a leg: Tropical Resort & Marina has pontoon boats for rent at very competitive prices–and to top it off–your take-off point happens to be in one of the most gorgeous areas in all of Florida. Located right on the St. Johns River, Tropical Resort & Marina is situated among stately oak trees, mystical hardwood swamps and the many incredible Florida species that call this area home. Located in historic DeLand, FL, Tropical Resort & Marina is on a pristine section of the beautiful, bountiful St. Johns River. Centered right in the midst of the beauty that is old Florida, Tropical Resort & Marina is a gateway to the most gorgeous sections of the St. Johns. In addition to fishing boat rentals and kayak rentals, Tropical Resort & Marina offers pontoon boat rentals for half and full day time slots. A pontoon boat rental can make a wonderful addition to your Florida vacation that you, your family and friends will never forget. If you are a resident of FL, renting a pontoon boat can be a fresh weekend activity that will feel like a vacation in and of itself. Pontoon boat rentals are a great way to spend family outings, reunions, business trips, or a day with your buddies. At Tropical Resort & Marina, you can rent a pontoon boat for a half day from 8 a.m. to noon or 1 p.m. to 5 p.m. If you need a full day to enjoy your pontoon boat rental, it's all yours from 8 a.m. to 5 p.m. All life jackets and safety equipment are included with your pontoon rental, and you have your choice between our 18' deluxe pontoon boat or our 24' deluxe pontoon. Five gallons of fuel is also included with the rental of any of the pontoon boats at Tropical Resort & Marina. Stop by our resort in beautiful DeLand, FL, or contact us today to discuss a pontoon boat rental on the St. Johns River. 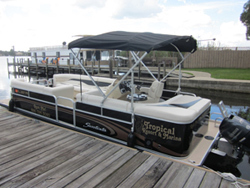 View our pontoon boat rentals.